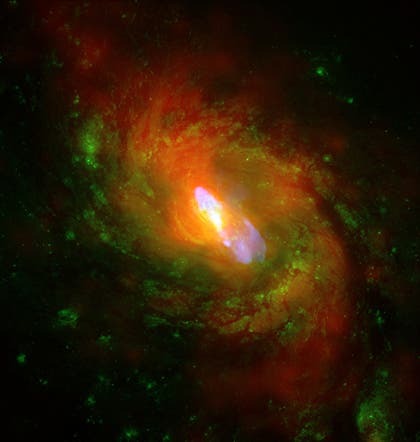 The galaxy NGC 1068 is shown above with an active supermassive black hole at its nucleus. Astronomers studying similar extreme galaxies in the infrared have found that in many cases material obscuring the nucleus may be located over an extended region, and not confined in a small torus. At the core of most galaxies including our own Milky Way is a massive black hole. Material falling into the environment of the black hole heats up, and can radiate dramatically, sometimes also powering the ejection of bipolar jets of rapidly moving charged particles. These so-called active galactic nuclei (AGN) are observed to have roughly two types of characteristics: bright, rapidly moving hot gas with dust emission features, or dust absorption with modest (or no) fast gas. According to the "unified" model of AGN, these and most other variations in appearance are primarily due to the angle at which a galaxy and its central engine are seen. In the first case the galaxy is seen face-on, and fast-moving gas close to the black hole is clearly visible. In the latter, the whole galaxy as well as a torus of obscuring dust around the black hole are seen edge-on; the torus blocks our view of the fast-moving gas and absorbs infrared in characteristic dust features. But is this simple model correct in all cases? CfA astronomers Andy Goulding, Bill Forman, Christine Jones, and Markos Trichas have undertaken a study of the origin of this infrared dust absorption feature. They specifically study the nature of the presumed torus: is it a small, uniform ring of dense material, a large extended structure of more diffuse material, or is it perhaps composed of many small dense clumps? The observed strength the infrared dust absorption is key to sorting out these differences. The astronomers used the infrared spectrometer on the Spitzer Space Telescope to examine the dust feature in all twenty nearby AGN having extremely large columns of neutral gas (Compton-thick AGN). The spectra provide quantitative measures of star formation as well as dust absorption. Writing in the Astrophysical Journal, the scientists reach several important conclusions. They find that in a significant minority of cases the absorbing dust is spread over a region larger than a torus, in support of one variant of the unified model. They also caution that these kinds of AGN have unusually high levels of star-formation; searches for other extreme AGN that neglect star-formation signatures are likely to miss a significant population of the most heavily obscured AGN. Image Credit: NASA and the Chandra X-ray Observatory.